I guess one could argue that this novel is at the very edge of crime fiction, but there is certainly mystery, and a plot that kept me listening until the very end. 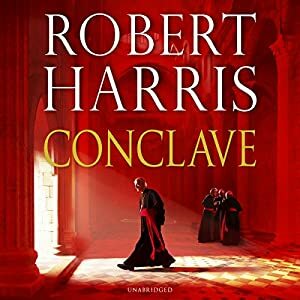 The narration is excellent, and there is plenty of drama and suspense as the Dean of the College of Cardinals leads 118 cardinals through the process of electing another Pope, making sure that their final choice is worthy of the office. At the end we are left asking how much influence the former Pope actually had in choosing his successor. Robert Harris was born in Nottingham in 1957 and is a graduate of Cambridge University. He has been a reporter on the BBC's Newsnight and Panorama programmes, Political Editor of the Observer, and a columnist on The Sunday Times. He is the author of five non-fiction books in addition to his bestselling fiction.